You can actually buy the interactive Harry Potter wands directly from The Universal Store. They look great and will work with my system. However, they are expensive. I wanted to give each of the kids attending the birthday party a wand, so obviously this option wouldn’t work. 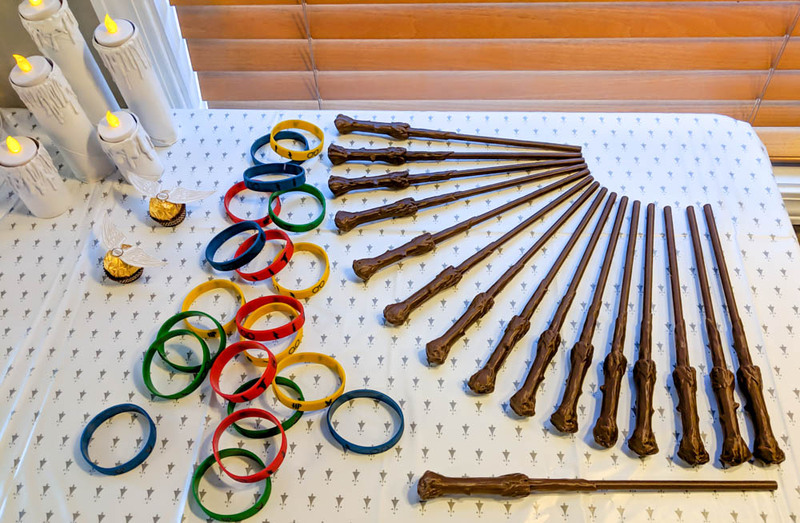 I ended up finding a fantastic STL of Harry’s wand on Thingiverse by user low_seb. 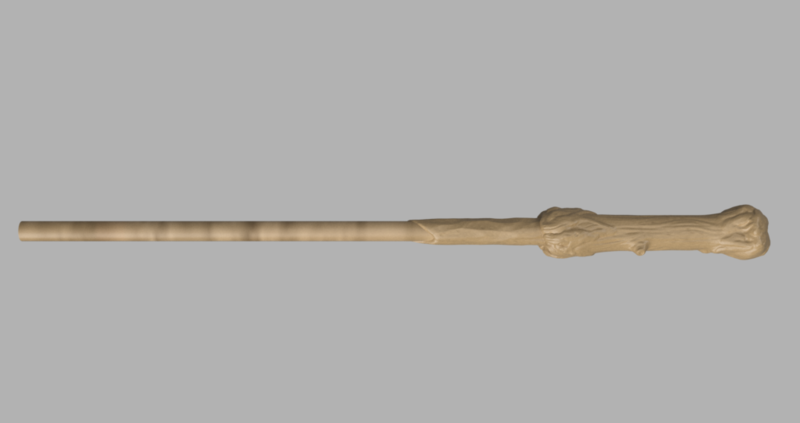 I scaled the original model up to 11 inches vertically (to match Harry’s true wand size). For my use I needed a wand a little thicker, so I scaled it to be slightly thicker in the X and Y dimensions than the original model. (I did this this so the next step wouldn’t throw off proportions significantly.) Then I modified the upper shaft in Fusion 360 to match the diameter of a standard hole punch (I used 7.5 mm) and ended the shaft with a flat surface. This was so the reflective surface could easily be hole punched and added to the end of the wand. I printed the modified wand vertically on my 3D printer without issue. I’ve published the STL on Thingiverse for you to download here. For a reflective surface I tried many different possibilities: reflective paint, IR reflective tape, and white micro prismatic reflective tape. The pictures below show the wands as seen with a regular camera, an IR camera close up, and an IR camera at a distance of around 10 feet. Standard Camera: Left to Right: white reflective tape, IR reflective tape, reflective paint, and bare end. IR Camera (close): Left to Right: white reflective tape, IR reflective tape, reflective paint, and bare end. IR Camera (10 feet): Left to Right: white reflective tape, IR reflective tape, reflective paint, and bare end. What ended up working the best was the white reflective tape. The IR reflective tape was unique because it allowed the tip of the wand to be flat black instead of glossy white, but in the end I chose the white reflective tape for it’s superior performance. It was also cheaper, which was an added bonus since everyone at the party got to take home a wand. The final wands, as presented at the birthday party. In part 2 I discuss the IR light / camera system for this project.